I've posted recently on the forums is my gender-bend thief/monk.spent a great deal of time on her so tell me what you think! Hope you like her. Oh, and speaking of artsy, creative stuff, here is something a little off topic and not related to Redstone. I really, really love Pokemon. It got me through some really tough times, like my Dad's deployments and my friend's suicide. I've been playing every since I was a kid and I recently picked up crocheting. 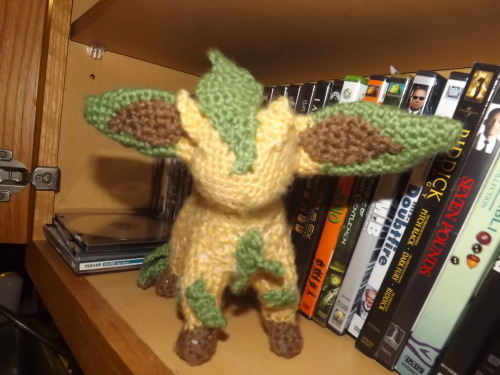 So, I decided to try my hand at crocheting all the Pokemon, all 600+, and I've started off with the Eevee evolutions, since I've always loved them. So here is one of them. If you would like to see more, tell me in the comments! 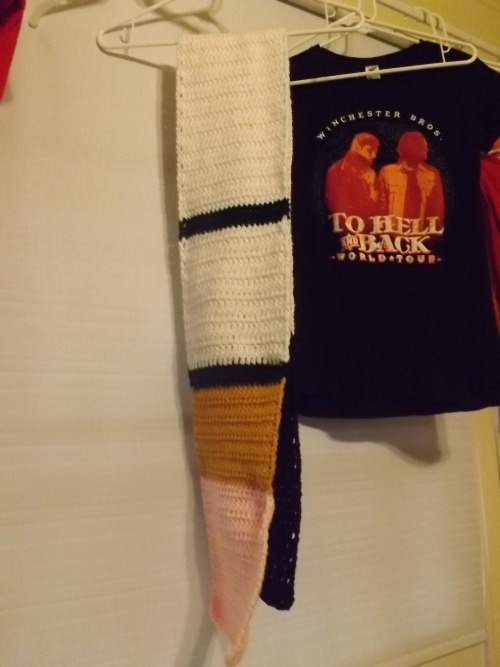 Also, I do scarves and hats, and they are not always related to Pokemon. 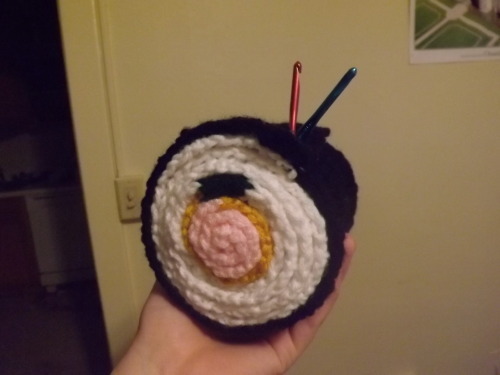 Like, here is a scarf that when rolled up, looks a little bit like sushi. Here is is all unrolled and not sushi-like. Ignore my Supernatural shirt. So there you have it, folks. My artsy side, both Redstone and real-life nerd related. Hope you all have a fantastic weekend! Super quick post then you can be on your merry way! I have some useful items for sale, since Jigg and I are trying to clean up our banks and storage alternate and figured someone else may want/need them. So if you want any of the items, feel free to PM me or Jigg in game. Good afternoon, my wonderful readers! This post is actually exceptionally long and I apologize for that, so I'm adding a "Read More" if you would like to delve further into this post. If not, just keep scrolling! I will love you either way. Hope you are all doing well. I know that things are slowly getting better for me. I mean, look two posts in one week, brought to you once more by my lovely Kindle. That hasn't happened in a long time, sadly, but hopefully I will post more in these upcoming days. Ok, so nothing too interesting to report personally. Gained a couple levels and got another thousand Dragon Hearts during the Monster Invasion event. I really enjoy that event, especially since every hit that you land equals another box in your inventory. I usually just go Lancer for it and just use Entrapment Piercing, and generally my inventory fills up faster than I can keep up. I know it is harder for people without Alacrity or Luck, especially those lame super avoid Chickens with their stupid AOE move. That's why I wish that if you were in a party, that the extra boxes you don't receive due to a full inventory would at least go to someone else who may need them. That way everyone benefits and no one misses out on the event merely because the enemies have crazy avoid. With this magical GIF, I wish you all a lux box next event. Today was also interesting because I got to experience my first GvG ever and it was against Fresh. I wish I had gotten a video of the GvG so you can see my constant dying, but, unfortunately, I did not have a recording program on my computer and was too engrossed in the battle to take screenshots. So if you happen to have a video, post a link or email me the video and I will love you forever and of course, credit you for helping me and being awesome. Anyways, it was fun but I must say, I had no idea what to expect and I kind of came into the whole thing blind. Jigg was still at work but I was hoping he would come home in time to at least be in most of the GvG. So I brought along his Princess, figuring that I could just body hide. Unfortunately, the main PT that my Archer was a party of filled up before Jigg could join, so I thought that as long as I moved her away from the action (and I mean far away) no one would bother her, since she would be bubbling until her rightful owner came home from work. I mean, maybe it's just me, but it seems kind of underhanded to attack a toon that is not only obviously not being played but is so far from the heat of battle to actually be seen as a threat. I guess I was wrong, though, and while playing my Archer, I saw Jigglypuff's name flash in the corner of my screen, stating that she had been killed. I felt bad, like I had basically given the other team 600 free points. I felt even worse for bringing her since Jigg didn't come home until about 5 minutes before the GvG ended, so it was just a waste of time to bring her and I handed the other team a free target to bash on for points. But enough about his toon, let's talk about how mine did in her first ever GvG. First off, like I said before, I was most definitely not prepared. I had forgotten a couple gears and was in general, felt like I was trying to focus on a hundred things at once. Seriously, if it weren't for my Lancer's Sidestep and Dummies, I think I would have died twice as much as I did. Also, with their Priest's Tower on, my knowledge moves were rendered almost useless, though our other lovely Knowledge Archer Saki did amazing and brought in most of our points. I think, though, for me at least, I would have been much better as a Power Archer/Lancer and maybe would have actually brought a couple people down. At the end it was funny. For some odd reason, the Necromancer on their team decided that I was their new target of interest and even though I couldn't kill them due to Tower, I thought it could be fun to see how far they would actually follow me from the main fight. I don't know, maybe they thought I was a threat (as if haha) or maybe they just thought I was cute. Either way, I lead them pretty far from the battle and I have to say it was funny since all they were doing was lowering my accuracy (I think, though I'm not too well versed in Necro skills), so that was mildly entertaining for the ten seconds it lasted. I feel that the Necro would not like me laughing.